Massacre in Charleston: 9 Shot Dead at Historic Black Church, Police Search for White Gunman | Democracy Now! state president of the South Carolina NAACP. DR. LONNIE RANDOLPH JR.: Senator Pinckney—first of all, good morning, and thank you for giving us this opportunity. And I, too, want to extend condolences from the NAACP to the family of Senator Clementa Pinckney. Senator Pinckney was a dynamic young man, very bright future, had made great strides in the faith community, as well as as a legislator and as a senator in the state of South Carolina, and had so much promise. And this is a regrettable situation. Nothing can be said to make this matter better, or consolation is very difficult at this time. AMY GOODMAN: Can you talk about the significance of Mother Emanuel, the Emanuel AME Church, from Booker T. Washington to Dr. Martin Luther King? AMY GOODMAN: And, of course, in Charleston, in this very place where the Emanuel AME Church massacre has just taken place, North Charleston is where Walter Scott was killed, an African-American man killed by a white police officer who has now been charged with murder. NERMEEN SHAIKH: That was Reverend Clementa Pinckney, pastor of the Emanuel AME Church. He was killed last night. He was 41 years old. He was also a state senator. He was elected to the South Carolina House of Representatives in 1996 at the age of 23. Four years later, he was elected to the state Senate. Dr. Lonnie Randolph, your thoughts? DR. LONNIE RANDOLPH JR.: I couldn’t have said it any better. Your words and the section of the tape that you gave on Senator Pinckney spells out the history of the AME Church—has always been a promoter and a fighter for justice and equality for all citizens, for all people of this state. And that church, throughout its history, has done an excellent job in this ongoing fight for democracy in America. 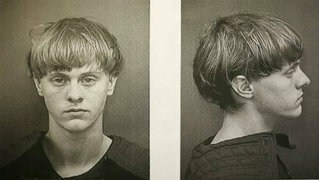 Again, what we know at this point is, in nearby Charleston, at the historic black church, the Mother Emanuel, the Emanuel AME Church, last night about 9:00, a white male gunman, believed to be about 21 years old, with sandy blonde hair, standing about 5’9”, opened fire in the church, killing nine people, wounding several others. The victims were attending Bible study at the Emanuel AME Church when he opened fire shortly after 9:00 p.m. on Wednesday. The police, the mayor are calling this a hate crime. They are saying whoever he is—they’re districting his picture widely—is extremely dangerous. This is Democracy Now! We will of course continue to follow this story, this tragedy, this horrific crime.